I need to confess: I’m a salad person. I know they aren’t for everyone and honestly, I think it’s because when people hear “salad” they think of a sad, wilted bowl of iceberg lettuce. People have been traumatized by crummy salads…and it's no wonder! If a salad isn’t satisfying, it literally leaves you hungry in about an hour. Not cool, salad. Salads need protein. Salads need flavor. You need easy salad recipes that will make you LOVE salad! First and foremost, salads should be filling. Whether it’s a side or a meal, your salad should fill you up and not leave you starving an hour later. Plus, salads often feel like diet food, right? While these yummy, easy salad recipes help you get your veggies in, they won’t leave you deprived. Salads should also be FAST. When you get a salad at a drive-thru, it’s ready right away. It’s easy. It’s quick and usually flavorful. When you put together creative salads at home, so many recipes call for labor-intensive chopping, grilling, sautéing and more. Well, who wants to spend 30 minutes cooking and end up with only a salad?! If you’re working on saving money by avoiding the drive-thru and eating at home more frequently, you need these awesome easy salad recipes! 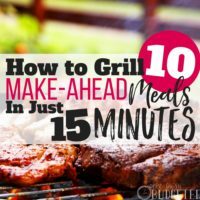 You need options ready in 15-minutes or less. You need salads that don’t taste like sadness and deprivation. Well, I’ve searched the web and found a bunch of easy salad recipes to satisfy everyone–even your hungry, meat-and-potatoes-loving husband. These recipes will get you in and out of the kitchen in less than 15 minutes (less time than it takes to get in the car and go through the drive-thru) and they’re easy. They don’t call for any ingredients you can’t find at your regular grocery store. Simple! If you’re like me, you want recipes with ingredients you find in your pantry. Nothing’s worse than buying an exotic ingredient, using a teaspoon of it, and ending up with a fridge full of spoiled food. It costs money and you feel wasteful. These recipes won’t leave you buying ingredients you’ll regret or are unable to use. These recipes are crowd-pleasers too. When you're asked to bring a dish to a barbecue or a party, these recipes come together fast and can be easily adjusted for additional servings. So yea, these easy salad recipes are great for potlucks! 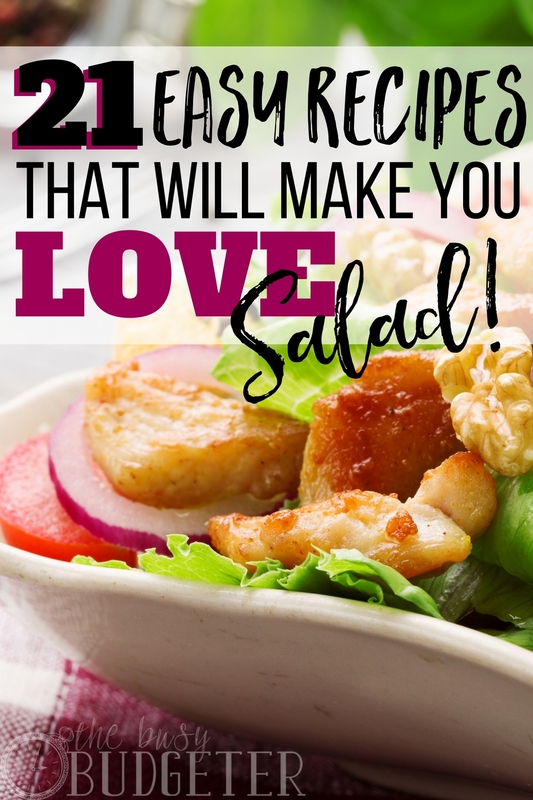 So, if you’re looking for great dinner ideas tonight to rekindle (or spark) your love for salads, here are 21 easy salad recipes to get you started! This crunchy Asian ramen noodle salad is such a popular crowd pleaser. The recipe calls for toasting the almonds and noodles for a few minutes in the oven, but frankly, it’s good even if you don’t take the extra step (and will take even LESS time than the 10-minute prep). Look for pre-chopped ingredients so you can simply combine them in a bowl and enjoy! If you’ve spent any time on Pinterest (like, who hasn't? 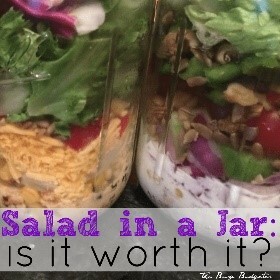 ), you’re familiar with the uber-popular salad-in-a-jar. I tested the concept out and found a lot of great fresh salad-in-a-jar recipes, plus a few helpful hints. One of the best recipes is the easy southwest salad. It’s a great option for lunch or dinner (and it’s good in a jar or in a bowl). This fresh salad has a great blend of sweet and savory. 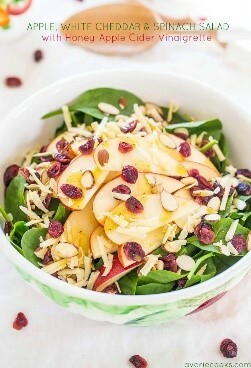 Apples and cheddar are perfect together, and with the honey vinaigrette the simple ingredients turn into a restaurant-worthy meal. You could amp up this salad with chicken or even bits of leftover pork chop if you want to get in more protein. You could also swap out regular cheddar for white, if you don’t have white cheddar on hand. 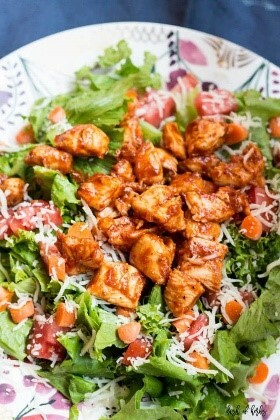 This barbecue chicken salad is SO satisfying and easy. She calls for sautéing a chopped chicken breast, but if you want to save time you could easily use rotisserie chicken or heat up Tyson Grilled & Ready chicken strips instead. 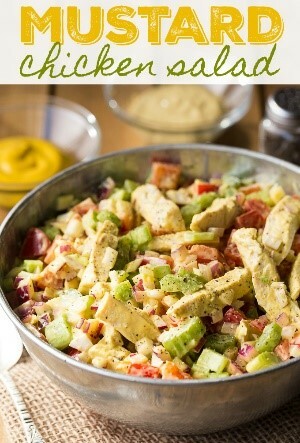 If you use leftover or precooked chicken, this salad’s prepared in less than FIVE minutes! I love how this recipe takes the best aspects of a baked potato (a.k.a. the cheese and bacon–yum) and turns them into a salad. This is a great side for a barbecue or potluck and it’s simple enough to please everyone! Using Ranch dressing gives all the seasoning you need. You could also turn this into a main dish by serving over a bed of spinach. I batch cook bacon so I always have extra bacon on hand for easy salad recipes. This is one of my favorite creative salads for potlucks, parties and meals. The recipe is so satisfying, this fresh and easy salad comes together fast, and everyone LOVES it. 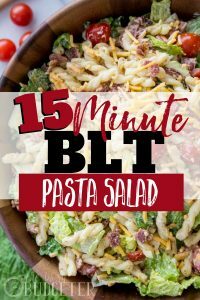 Take the best aspects of a BLT, add pasta, and you end up with a side salad that doubles as a yummy meal! SO GOOD. I often buy grape tomatoes and then forget to eat them before they go bad. This recipe is awesome if you need to use up mini tomatoes. 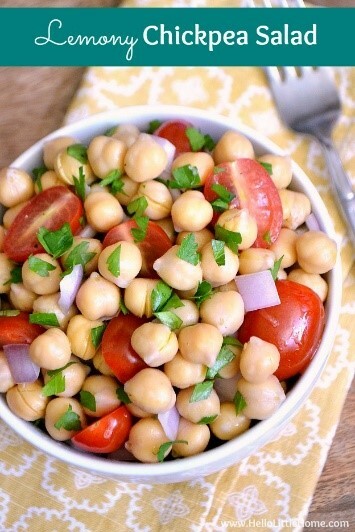 Keep a couple of cans of chickpeas in the pantry and this creative salad comes together easily. This salad makes a great side dish and it has plenty of protein for a satisfying lunch. This is my top crowd-pleaser salad. Seriously, EVERYONE who tries this salad loves it and asks me for the recipe. 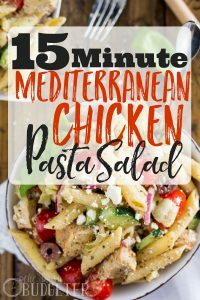 The salty feta, olives and chicken go together so well, and the pasta salad whips together SO FAST! I use my favorite Tyson Grilled & Ready precooked chicken so I don’t deal with extra prepping. Check out this recipe—you'll love it! 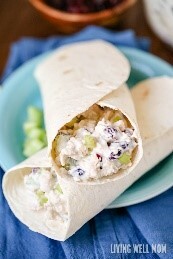 This cook uses this chicken salad as a wrap filling, which is a great idea, but chicken salad’s also perfectly delicious and satisfying as a salad on a bed of lettuce or served with crackers. Use precooked chicken for easy and fast prep. I love the cranberries in this! It adds a little sweetness to take this chicken salad to the next level. Caprese salad is SO darned yummy and simple. This easy salad recipe is a great use for basil and tomatoes. 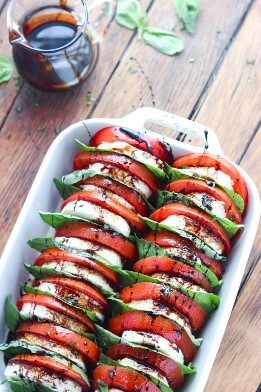 Dress the tomatoes, basil and mozzarella with olive oil and vinegar or the balsamic reduction as called for here. The reduction takes 15-20 minutes, but the rest of the fresh salad takes literally three minutes to pull together. Buy a balsamic dressing to save time. Watermelon seems like a strange pairing with feta, but let me tell you—it goes perfectly! The crisp, fresh salad comes together in about five minutes, and the simple balsamic vinaigrette is perfect. The combination of fruit and veggies are so light, refreshing and summery. 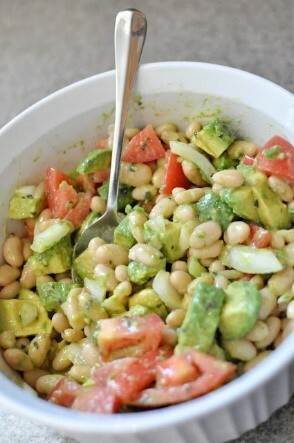 This easy salad is seriously addictive! 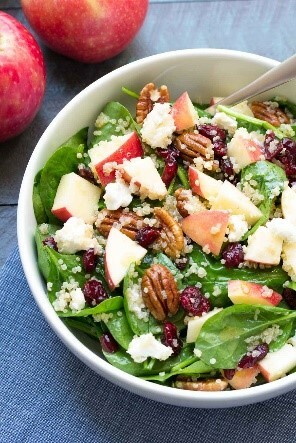 This salad is one of my absolute favorites! It’s got walnuts and chicken so you get plenty of protein. The avocado and strawberry go so well together, it's a-mazing. This easy salad’s an awesome lunch and satisfying enough for dinner. Use precooked or rotisserie chicken to save time and toss this together in less than 15 minutes. 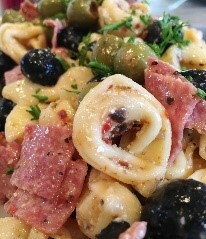 Using cheese tortellini in this pasta salad takes the cheesy deliciousness into next-level territory. Norine recommends having the deli counter cut salami into chunks for you, but this salad’s also a great way to use up any salami you happen to have on hand. With olives and yummy dressing, this salad is super satisfying. This salad calls for quinoa, which is a delicious rice-like grain. (It's good, I promise.) Quinoa takes a little time to cook, so I suggest using microwavable packets of quinoa to speed up your prep time. MUCH easier. 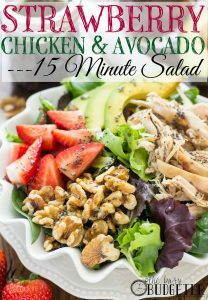 This salad is also amazing with leftover turkey or shredded precooked chicken. You could use pork as well for a protein boost! Once again, this is a great way to use batch-cooked bacon and save time. The rest of this unique salad is fast and so different (in a good way). 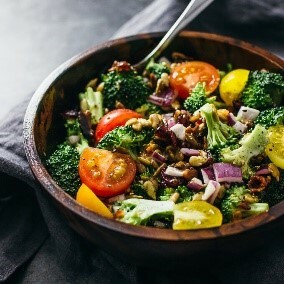 The dressing’s a little sweet but not overly so, plus, this salad is a huge hit for any broccoli lovers. This salad makes a great side dish or even a main dish for lunch or a light supper. Attention mustard lovers: This is the salad for you! Using ranch with Dijon is genius! The combination adds an awesome flavor boost. Using precooked chicken is a huge timesaver and chopping up the celery and pepper takes almost no time at all. 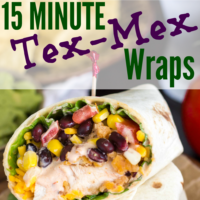 Use this as a great wrap or sandwich filling! I love how simple this salad is. It’s vegetarian if you’re looking for an option for Meatless Monday or to satisfy everyone at your next get-together. White beans are inexpensive and create a filling protein-rich base. Serve this over spinach or romaine lettuce if you like, or as a side with steak or pork chops. Traditionally I haven’t used Doritos in my taco salad, but HELLO-game changer! 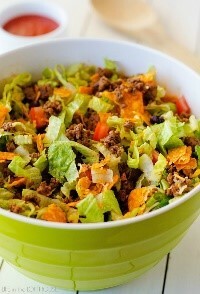 Using Doritos is a simple way to get cheesiness and extra flavor in your taco salad. Ground beef cooks up quickly, so you can whip this salad up much faster than you might think. If you aren’t a fan of Catalina dressing, use ranch and a little hot sauce. 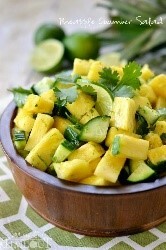 Check out this ultra-refreshing recipe for a beautiful tropical salad. If you're looking for easy salad recipes for a Mexican food get-together, this is a fun option because the cilantro and lime would go well with any Mexican-style dish. I LOVE fresh pineapple and you can always purchase pineapple pre-sliced in the supermarket to save time. Use this as a cooling side for a spicy chicken, fish or steak dish. Looking for a Caesar salad fix? The addition of pasta to this Caesar salad makes it feel more like a meal. Serve the pasta salad over romaine if you like or simply enjoy this hearty salad as a main dish. Use preooked chicken to save time and throw this together quickly. This salad requires no chopping, dicing or slicing. Woohoo! It’s so simple to create–and who doesn't like easy salad recipes that come together crazy-fast?? The peas and pasta combo works so great together. You could use any pasta shape, but shells are really perfect. 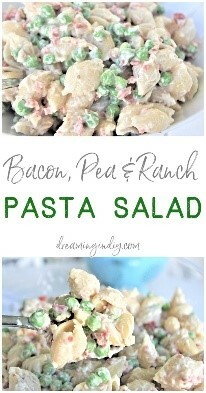 This is a great potluck salad too! Don’t give up on salads! 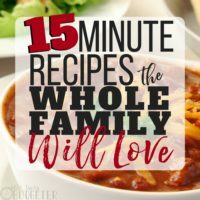 They’re a quick, satisfying dinner and there are many easy recipes you can toss together quickly. You'll love these easy salad recipes, so put them together tonight! What are your favorite easy salad recipes? Do you prefer pasta, potato or traditional lettuce? 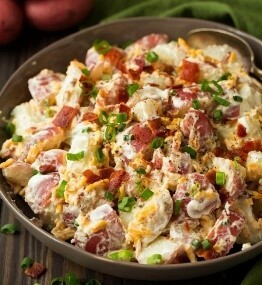 Cheddar Bacon Ranch Potato Salad?! What! Yum!! Going to have to try a few of these. 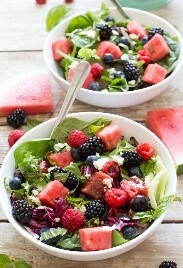 Love salads in the summertime! Especially using fresh veggies from the garden! It’s 102 F here and this is what I call Perfect Timing ! Than you so much for this no sweat lunches collection ! 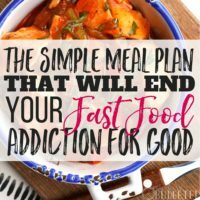 This is a great list and just what we needed since we would love to increase our salad intake and have “healthier” food choices. Wonderful salad idea. I was finding a great salad idea for my dinner and I got it. Thanks for sharing!